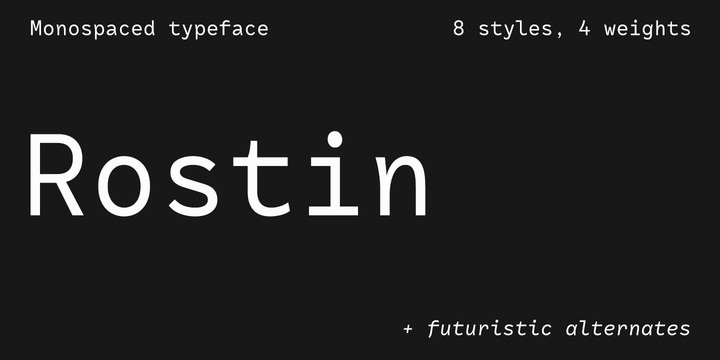 RF Rostin is a monospaced typeface cfreated by Misha Panfilov and published by Russian Fonts which is available in 8 styles, 4 weights (from UltraLight to Bold) with accompanying italics, useful OpenType features and multilingual support. It merge well on both small & large sizes. It is suitable for typographic purpose, editorial use but also for branding, web. Enjoy! Price: starting from $26,00 for one font to $119,00 for all 8 fonts. A font description published on Tuesday, July 25th, 2017 in Fonts, Misha Panfilov, Russian Fonts by Alexandra that has 2,922 views.